Upgrade your printed presentation with richer, more vivid color. Brighter and glossier than plain paper. Get a more professional look with this heavier weight, gloss coated stock. 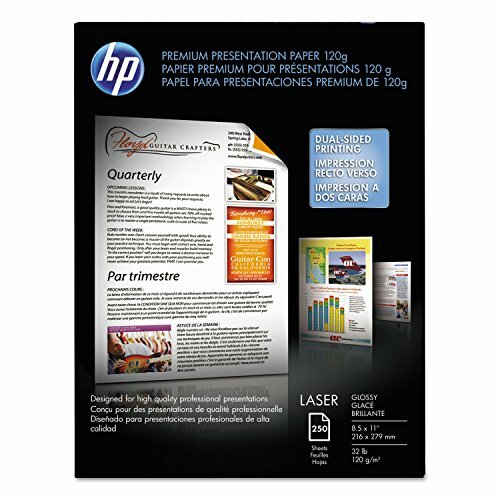 Get the best results with your HP LaserJet printer, for which this paper is optimized. Print reliably on both sides and avert paper jams. Size: 8 1/2 x 11; Paper Color(s): White; Paper Weight: 32 lb; Sheets Per Unit: 250. Bright, glossy finish delivers sharper images and richer colors than plain paper. Paper is specially formulated to minimize paper jams and multi-feeds.